Are you ready to test your fate? Let’s talk a little Brave. This is Pixar’s attempt to enter the princess movie and their first movie with a female protagonist (and until Inside Out only). I’ll say it right from beginning Brave is my least favorite Pixar film. That doesn’t mean I don’t enjoy it. I do. 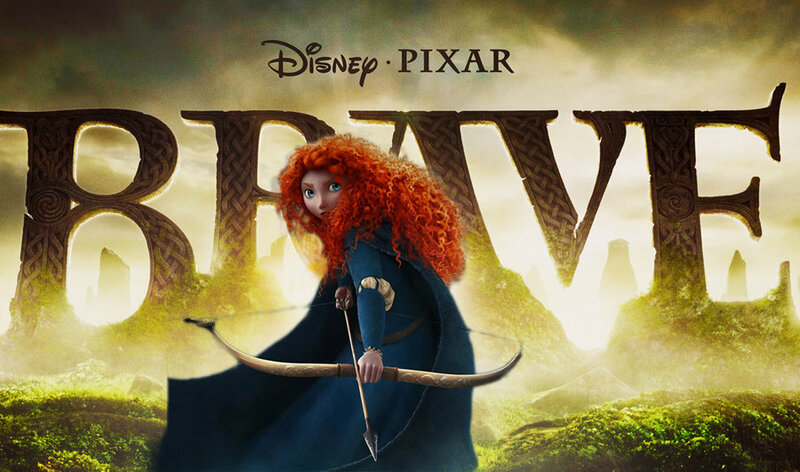 I like all the Pixar films but the problem with Brave is it doesn’t deliver the type of story it promises to tell. My next lowest Cars 2, flaws and all, is actually consistent from frame 1 a spy movie and stays very close to the genre throughout. Brave promises an epic legend and in the end we kind of get a nursery rhyme style fable (like an Aesops Fable). I love the way Brave starts out. We see the Princess Merida independent and free spirited out climbing mountains and touching the sky. As a fellow curly haired girl I love Merida’s look and her hair! It’s gorgeous. You don’t see curly haired heroines often and I love hers! Merida’s main source of conflict comes with her Mother Elinor (voiced by the great Emma Thompson) who wants her to take her responsibilities as princess and future queen seriously. They fight and argue, neither listening to each other at all. I think nearly all girls I know can relate to this dynamic with their mother. Elinor decides to force her daughter to participate in a Highland Games that will decide her betrothal to one of 3 idiots. I do really like that they do not make one of the suitors a possible love interest. That would have been such a cop out. But Merida decides she will shoot for her own hand in a both prideful and desperate attempt to change her fate (can you blame her for not wanting to marry one of these guys?). Well, her Mother and her fight after this display and embarrassment (I like that both Mother and Daughter are at fault here). 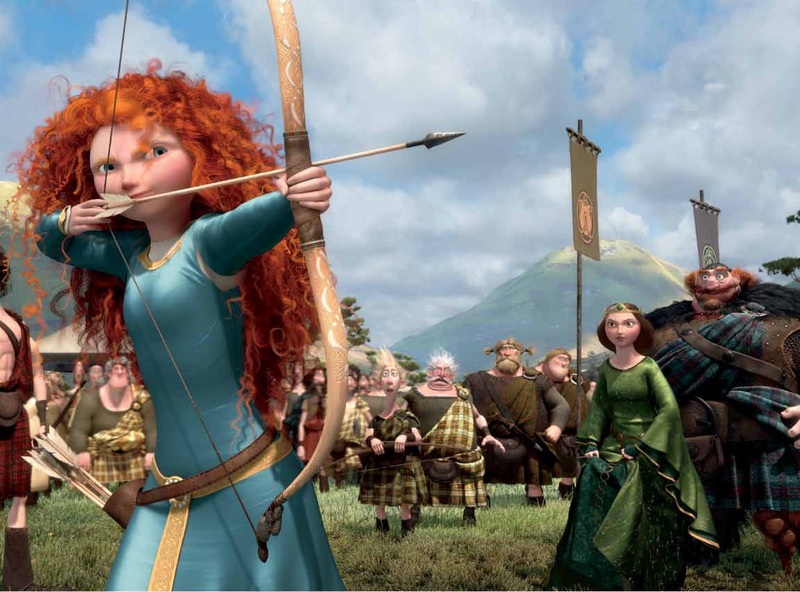 In frustration Merida swipes a sword through her mothers tapestry with her family and storms off into the forest. As she races in the forest her horse throws her and she ends up at a cottage with a goofy witch. In Merida’s defense the witch does look harmless enough and is actually a pretty funny character. In some ways she’s a little bit like Ursula although much less developed and memorable. Merida asks her to change her Mom so she can change her fate. I honestly don’t think she would ever assume her Mother would be turned into a bear or hurt physically in any way. She wants her Mother to all the sudden be accepting of her life choices and not make her go through with the betrothal, which at the moment is her fate. The witch warns her about tempting fate but she does anyway and gets a cake to give to her Mother. She eats it as do her troublemaker triplet brothers. All of them get turned into bears and that’s where Brave starts to lose me. Like I said before it goes from being epic in feel, a legend, to being a nursery rhyme about a woman turned into a bear. One might say it goes from being very grand and big to being small. I still think it is watchable. It’s certainly a million times better than Brother Bear which has an oddly similar story. Merida goes back to the witch to find out what they must do and are told they have 2 days to break the spell or Elinor will remain a bear. To break it “fate be changed mend the bond torn by pride”. So that’s pretty much the rest of the movie. Elinor and Merida learning to respect each other. But even that would be fine but the tone varies greatly between slapstick with the brothers who are also bears, pretty scary scenes with the bear Mor’du and sentimental scenes of Merida fishing with her Mom. Small children may be scared by the Mor’du. I know one of my nieces had to be taken out when I took them to see Brave. It’s very realistically done. 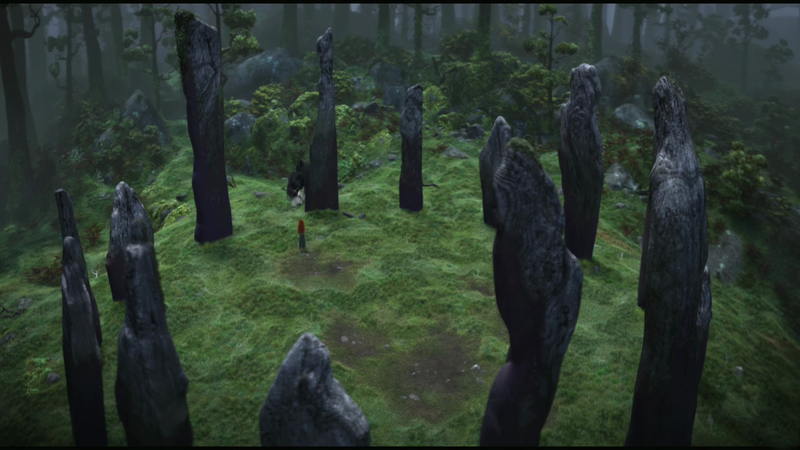 The animation throughout Brave is stunning. Whether it is the fierce bear Mor’du or the grand vistas of Scotland it looks so beautiful. 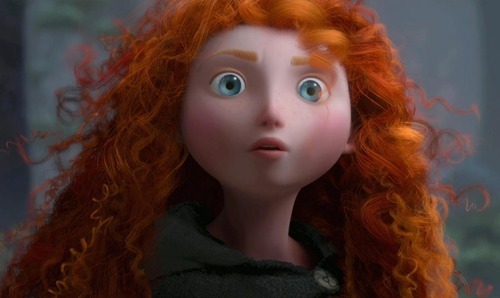 The voice acting is great in Brave with Kelly MacDonald a striking Merida, Thompson as Elinor, Billy Connolly as King Fergus, Julie Walters as The Witch and Robbie Coltrane, Craig Ferguson, and John Ratzenberger all contributing talent. The music by Patrick Doyle is some of Pixar’s best. I also love the songs by Mumford and Sons and Julie Fowlis. I do also love the core message about family and mending those bonds no matter how different we might see. I like the resolution and that it doesn’t involve meeting a man or being rescued. There also aren’t that many movies that explore the relationship between a Mother and a Daughter especially in animation and I think many girls can relate to the generational and communication gap between Merida and Elinor. I certainly can and felt many of those same feelings when I was Merida’s age towards my Mother (who was a near perfect Mother). Most girls I know want to do their own thing. They want to create their own fate not have it decided for them by anyone else. All of that works in Brave. It just feels disappointing because of what we expected to receive from the introduction. Not the epic quest we were hoping for. I do like the ending with Pixar pulling off the emotional scene very well as they always do. Another problem I think it has is a story like this usually has a central villain like an Ursula who antagonizes the heroine or shows some kind of real threat. 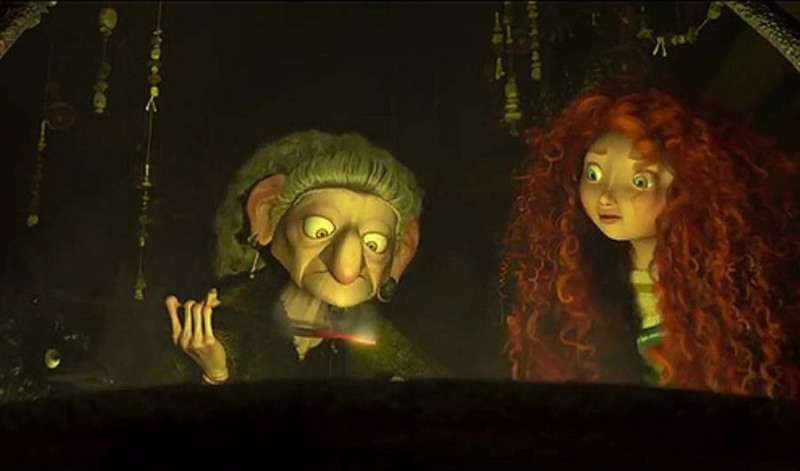 The witch in Brave is only briefly seen and isn’t really a villain. We all know how Brave is going to end so without the villain it becomes kind of muddled and predictable. Frozen also doesn’t have a central villain until very late in the game but to me at least that works much better because you have other unpredictable elements like 2 princesses and an ending which again for me really worked. Plus, Frozen is a musical which is a favorite genre of mine and much better comic relief in Olaf. So for me Brave is a missed opportunity. A lot of the problem probably comes down to the change in directors midway through from Brenda Chapman to Mark Andrews and the other issues they had making the movie. It’s not bad. In fact, I enjoy watching it but it could have been a real masterpiece. They never will but I would love for them to go back to the world of Brave and give us a true legend. I want battles and a wicked Queen out to take Merida’s thrown. That’s the kind of legend we were promised (especially in the trailers) for Brave but we didn’t get. Still definitely worth a watch. Overall Grade- C Not bad Pixar considering this is the lowest grade I will give one of your movies. Also a lot of people were very upset that Wreck-it Ralph didn’t win the Oscar. I actually think both movies suffer from the same problems. They don’t for me deliver what they promise in the introduction but they both have characters I really like. I also gave Wreck-it Ralph a C and I stand by that grade. If it were me giving out the award that year I would have picked Paranorman, which is funny, creative, well paced, quite scary, with a very unique take on a bully villain. I watched it with my friends last Halloween and it holds up very well. I also think Pirates Band of Misfits is great, but that’s just me! Wreck it Ralph, Paranorman, Guardians of the Light…there were so many movies that year which would have deserved the award over Brave. I think you mean Rise of the Guardians? I agree it is better than Brave. Yeah…. (I always confuse the title because they changed it for the German release). Oh I didn’t know that. Cool. I agree it is a good film and I think better than Wreck-it Ralph and Brave. Still would pick Paranorman but just my opinion. It really is one of my least fave Pixar films as well. I blame the production problems. Yeah I think so. It’s interesting in Creativity Inc Ed Catmull says they also had put the Brave people in a separate building thinking that would help them but I guess it caused a lot of problems. You can sense less an influence of the brain trust. He also says in the book that Mark Andrews came in and did magic with the movie. You can just tell it is 2 different stories. But that said I don’t think it is terrible. Still lot I like in it. I think I might have a theory of why Brave ended up being a cluttered mess. Keep in mind this based on OBSERVATION not facts. The original director Brenda Chapman based Merida off of her daughter…who was 6 years old at the time. I think Chapman might have had trouble trying to write a teen based on a kid and may have lead to her being booted off. Again that’s just a theory. But look at Riley from Inside Out. Pete Docter was inspired by his daughter who was the same age as Riley and look how that film turned out. Merida comes off as immature and spoiled for me and any personality she had was ripped off from the other princesses in the 90s. That’s a really interesting point about Chapman’s daughter. It’s clear she was very personally invested in the project and they had a bit of a falling out. Merida is immature and people say the same thing about Ariel but I think that is part of being that age. Especially if she is being forced to marry I kind of get it. That’s how I would have been. But it could be something with her daughter. I am not the biggest fan ever of this movie. There is too much witchcraft in it! I’d probably go B- with this one. It’s not bad, but it probably could have been a little better for sure. I’m sad to hear that production problems changed and that Brenda Chapman got taken off form the project. Oh well! Still, this film is worth checking out. I’ve actually heard a couple people say that this is almost like a rehash of older animated films like Mulan and Brother Bear. Honestly, I can see why someone would say that. Even so, I can agree with this winning the Academy Award for Best Animated Feature. Paranorman was decent, but I don’t know if I’d have voted for that one. 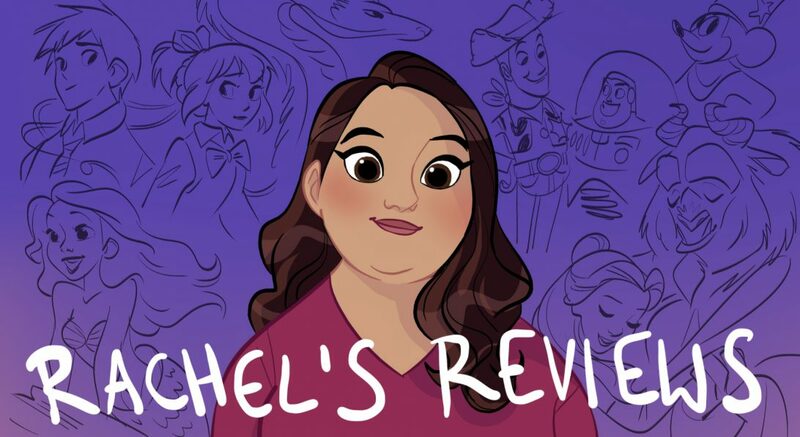 Also, Wreck-It-Ralph was very creative and such, but I wouldn’t put it up there with say Lion King or Frozen, all those really great classics. Anyway, great review once again! You’re welcome! Also, great to know that you enjoyed this film more than you thought you would. I think if this was the only Pixar film people wouldn’t be as tough on it. It’s not a masterpiece but still entertaining. Agreed! Spirit: Stallion Of The Cimarron is one of DramWorks best for sure. Of course we can likely agree that Prince Of Egypt is better, but Spirit is also great. I’m just sorry that Spirit was only moderately successful. Well, I guess that’s all thanks to it being released around the same time as say Star Wars Episode 2, Lilo & Stitch, Spider Man, and some others, eh? Anyway! I think it is kind of a tough sell and tricky film to market. Hard to get people in the seats but once they are there they will like it. Yes, many people will enjoy Spirit once they start watching it, that’s for sure. Although, my friend Tyker watched it with me once years ago and said that the concept of none of the animals talking was rather dumb. I would disagree, but whatever. To each his own, right? I agree so much with this review. Brave is fine, but it seemed like it had the potential to be so much more. It has a cool fiery heroine, and the archery scene with the three guys and her stepping in is pretty awesome. But then it all kind of went down hill and as you said got quite predicable. I did like the visuals and the soundtrack, the plot itself was just lacking. Hey 1/2 aint bad. Wreck-it Ralph is fine. I just think it loses its way when it gets to Sugar Rush and wish they had gone into more games. I hope they do that in 2.